Our assignment was to write about an imaginary meeting with either a historical or fictional character. After brainstorming with my brother, I decided to meet one of my favorite characters from one of my favorite series: Reepicheep from the Chronicles of Narnia. I wrestled a lot with writers block on this assignment — ugh! — but in the end, I think I like how this assignment turned out. A couple of quick notes on this post~ 1) I described Reepicheep as black with a shrill voice as Lewis describes him in the books. This does not mean I picture him this way. 😉 2) ‘Chelra’ is an anagram of my name and is pronounced ‘Kelra’. “I can hardly believe it!” I grinned, running down the hill towards the stream at the bottom. “Mother actually let me go off and explore by myself for the afternoon. Well, I suppose it is only because it’s my birthday…” My thought trailed off as I slowed myself down and managed to stop at the base of the slope. “The woods in Narnia are so lovely in August!” I exhaled delightedly. After a few more moments of drinking in the scene, the sun, and the sounds of the rushing water, I set off to follow the stream down into the woods. “Hello! Hello!” a squirrel chattered from the branch of the beech tree above me. I smiled and waved back. Now that Aslan had come back and Caspian X had been placed on the throne, the old Narnians – the talking animals, the dwarves, the centaurs, the fauns, the dryads and naiads – had all come out of hiding. I was still astonished at how many were left after the many crusades led by my people, the Telmarines, in the attempt to exterminate them. “My own great-grandfather fought in one of those,” I remembered ashamedly. “But those days are gone,” I declared out loud, resolutely shaking my head to banish my dismal reflections. “Narnia is alive!” And this afternoon, I was part of it. I had rambled about for an hour or two, when I heard the sound of horses coming through the woods. Then, there were voices – men’s voices, a youth’s voice, a shrill voice. They came closer. Hiding behind a sturdy maple tree, I peered around the trunk and waited to see these unknown intruders. In a moment, the riders emerged. First, on a black charger rode the youth. He was curly-headed and blond, wearing green hunting dress with a dagger and horn at his side, and looked to be about sixteen. Following rode several older men, also in green. With one of these I saw a flash of red, and starting in surprise, I saw a small creature mounted behind one of the hunters. 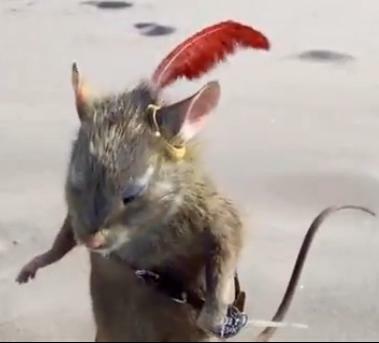 It was a dark mouse, I realized, about three feet tall, wearing a golden circlet with a red feather jauntily sticking up out of it. 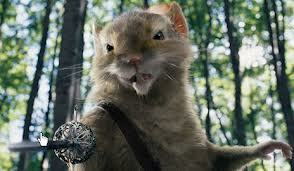 And thrust into a small strap across his furry chest was the tiniest rapier I had ever seen. They had nearly reached the tree I from which I was watching when the mouse noticed me. “And who goes there?” His was the shrill voice I had heard. To my embarrassment, the entire party halted their horses and turned to look where the mouse gestured with his sword. A frantic thought of running home as fast as I could flashed through my mind, but I just as quickly dismissed it. I knew they would be able to quickly overtake me, since they were on horseback and I was on foot. And as they were plainly not ruffians, I felt it would be safer to risk their acquaintance than their pursuit. Coloring, I stepped out from behind the maple. “I am Chelra of Haladale.” As I dropped a quick curtsy, I noticed my bare feet were hardly clean. “And at my age, too!” I thought, biting my lip. “And that is the village yonder, I presume?” the mouse inquired. “It is not far, I hope?” one of the men queried. “Take the lead, Chelra of Haladale,” the mouse rejoined gallantly. “I shall follow you,” he added, dismounting. Several others followed his example, excepting a few of the oldest men and the one dwarf. A little shyly, I took the lead and began weaving my way back towards the edge of the woods and the village. I desperately wanted to ask them who they were and what they were doing here. “But come on Chelra,” I scolded myself. “It’s obvious they are hunting, and you don’t want to sound too nosy.” Fortunately for me – though unfortunately for my curiosity – the men did not ask me what I was doing there. “It is my seventeenth birthday today, Sir Mouse,” I explained, “and my mother said that I might explore in the woods this afternoon – so long as I am home in time for dinner.” I hoped he would not think me childish for frolicking so. “I see.” His red feather bobbed as he punctuated his words with a succinct nod. “And what brings you here?” I felt that asking the mouse was less awkward than asking one of my own kind. “Well, my lady, my king, Caspian, is out hunting today along with a party of his knights and squires of which I am honored to be a member,” he informed me. “I am Reepicheep, knight of Narnia and loyal servant of his majesty, Caspian X,” he introduced himself, pausing to execute a noble bow. We emerged from the trees now, and I began to lead the party – the king’s hunting party – up the grassy slope. “You are the mouse who fought alongside the kings and queens of old in the battle against Miraz, then?” I asked in wonder. 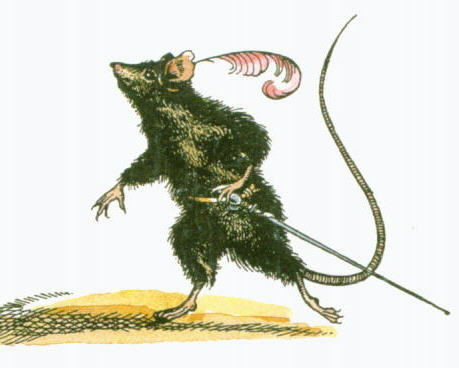 “The very same, lady,” Reepicheep replied, seeming honored that his reputation had preceded him. Our conversation paused as we needed the breath to crest the last bit of the hill. Some of them murmured assents, and we turned and went onward, Reepicheep the mouse still keeping step with me. The mouse twitched his long tail delightedly and made what looked like a mouse’s smile. “Most certainly, lady,” he replied. With that, he proceeded to tell me of how High King Peter had dueled with the wicked Miraz, how the Telmarine Army had attacked, how Aslan had awakened the trees and the river god, and how the sovereign lion had given him his new tail. I listened spellbound to his vivid account. Oh, I love Reepicheep! Great story!